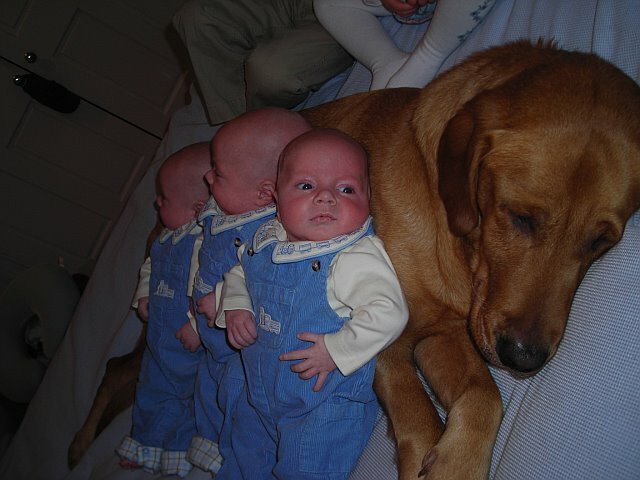 This may not be PC but has anyone else ever noticed the striking similarites between babies and puppies? I first noticed it many years ago, long before I had any babies on board. I was working in advertising and managing one of Johnson & Johsnon’s many baby brands. At the time, I was recently married and we had recently gotten Finnegan, an 8 week old golden/lab mix. I was at a print shoot and in order to get the babies to “perform”, a “baby wrangler” was rewarding them with Cheerios. The logistics of the “performance”, as you might imagine, weren’t all that daunting. In fact, they could be pretty much summed up with “sit” and “stay” — the very same commands that I was trying to teach Finnegan! And, while I wasn’t using Cheerios as a reward, I very well could have — they probably would’ve been a whole lot cheaper than those stinky liver treats they recommended in puppy class! As I left the shoot and went home to Finn, I continued to mull over the similarities… babies and puppies both need to learn basic commands like sit and stay… and ideally, both will learn to “fetch” as well. Neither babies nor puppies are potty trained and both tend to whine and cry at night. Both can warm even the coldest of strangers; they have the power to stop people in their tracks and elicit a a broad array of “oohs”, “aahs” and “isn’t s/he cute!” Both require an education of sorts, trips to the doctor and a remarkable amount of patience. Additionally, they both seem to be recipients of a sort of unconditional love that you don’t know you have in you… until a puppy or baby arrives. I’m not sure if it’s just us — and given that I basically gave birth to a litter, perhaps it is — but, even so, I hope you will agree that there are at least a few striking similarities between our favorite four-legged and two-legged friends.